Deciduous chestnut trees grow worldwide, particularly in the northern hemisphere. Once a staple food of Native Americans and the source of a prized hardwood, American Chestnut trees thrived in the woodlands of the eastern United States. But a fungus essentially wiped them out in the first half of the 20th century. Most chestnuts you find in stores nowadays are imported or cultivated from introduced species. You can visit some chestnuts orchards to harvest your own nuts by gathering the ripe ones off the ground. Wear gloves, because chestnuts grow surrounded by a spiny shell, which begins to open as the fruit matures. The starchy center of the shiny dark-brown nut, called the endosperm, is the edible portion. 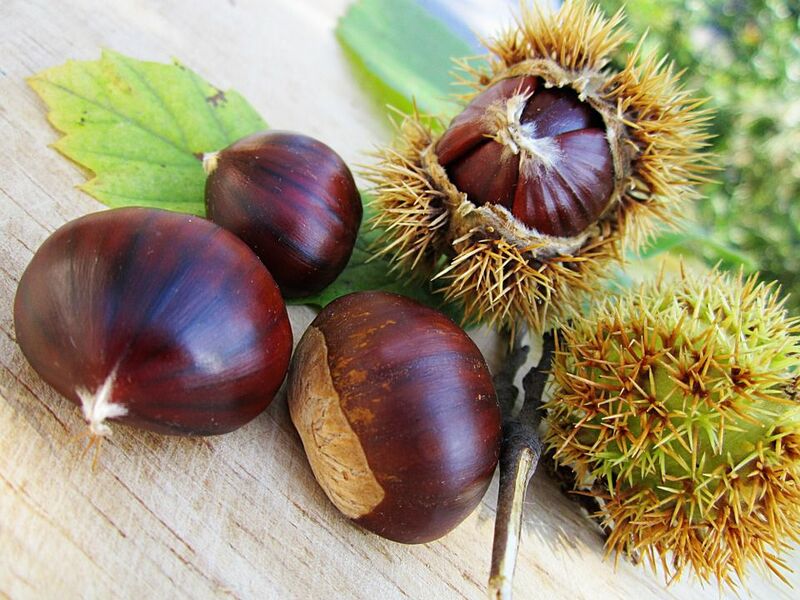 Chestnut harvest typically takes place in September and October; the nuts are more prevalent in stores in November and December during the Thanksgiving to New Year's holiday season. You might see them fresh still in their spiny armor, or already peeled down to the hard nut layer. Street vendors in New York and other cities sell snack-size bags of roasted, steamed or boiled chestnuts from carts in tourist-heavy areas. The mild flavor of chestnuts makes them versatile for both sweet and savory dishes. The texture of a chestnut resembles that of a potato: a bit crunchy and bitter when raw, cooked chestnuts turn buttery and sweet. The flavor is reminiscent of a sweet potato. They can be added to soups and stews, baked goods, and dishes from stuffing to pasta. Chestnuts are often sold fresh during the winter months, making them a popular holiday treat. Fresh chestnuts can be roasted, steamed, boiled, deep fried, or even microwaved. Always score the skin of fresh chestnuts before cooking them to allow steam to escape and prevent them from exploding. Because fresh chestnuts contain a high percentage of water, they are more perishable than most nuts. Keep them refrigerated in an airtight container until you're ready to use them. If you buy them directly from the producer shortly after harvest, they will last for a few months in proper storage conditions. Chestnuts from the grocery store probably spent some time in the open air and began "curing," or losing some of their moisture. While this actually makes for better eating, the nuts become more perishable as they dry. Refrigerate store-bought chestnuts promptly and use them within a few weeks. Fresh chestnuts can also be frozen for up to six months. Dried chestnuts last for many months when kept at room temperature away from sunlight. Store them in an airtight container to keep pests and moisture at bay. Dried chestnuts can be reconstituted in boiling water or ground into flour and used in baked goods. You might find chestnuts in jars or cans at your gourmet grocer, but don't confuse the water chestnuts commonly found in the Asian food section of the grocery store. They aren't the same thing. Canned chestnuts work fine in many recipes, including soups, stuffings, and stews. It's also possible to purchase chestnut puree, either sweetened or unsweetened, for use primarily in baked goods. Chestnut flour is used in many baked goods throughout Europe. Because chestnuts are high in carbohydrates and low in fat, the flour resembles other grain flours, like wheat. Chestnut flour is used to make fritters, cakes, pasta, and even polenta. Unlike other nuts, chestnuts are low in fat with high moisture content. They contain mostly carbohydrates, making them more nutritionally akin to a grain than a nut. Chestnuts are also high in fiber, low in calories, and rich in complex carbohydrates and vitamin C.